The great poet Homeros, accepted as the founder and the first writer of European literature is from Izmir. The first and the most famous written work of the World, the Illiad belongs to him. 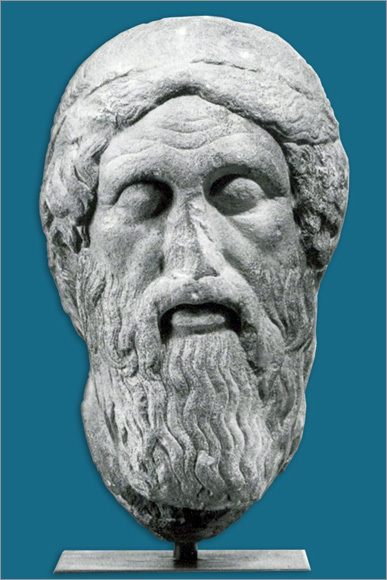 Homeros who lived in 8th century B.C., narrates in The Illiad what befell to the city of Troy about 500 years ago. It is said that even Alexander the Great was deeply fascinated by this work which is the most read, loved and admired work of the world and that he even slept with this epic under his bed. Troy which is about 32 km. away from today’s Canakkale used to be a very wealthy city once. According to the legend, everything starts when Paris of Troy, a herdsman in Mount Ida (Kaz Mountain) chooses Afrodit who offers him the love of the most beautiful woman of the world, as the first among the three great goddesses Hera, Athena and Afrodit in the first beauty contest of the world. Beautiful Helene who is married to the Spartian King and Paris who is the prince of Troy fall in love and escape to Troy together. The cities of Greece found a combined army and big navy and attack Troy. The city of Troy, with its unmountable walls bears this siege for nine years. However, eventually the Akha army conquers Troy with its wooden horse deceit. Then the Dark Ages begin which continues with the siege of Anatolia and which lasts for 400 years. Many civilisations in Anatolia gets ruined.